This post was written by our guest blogger, Charlie Antoine. To read the original post, click here. The buyer's journey, commonly known as the purchase funnel, is a marketing model that illustrates the path a consumer makes towards purchasing a product or service. 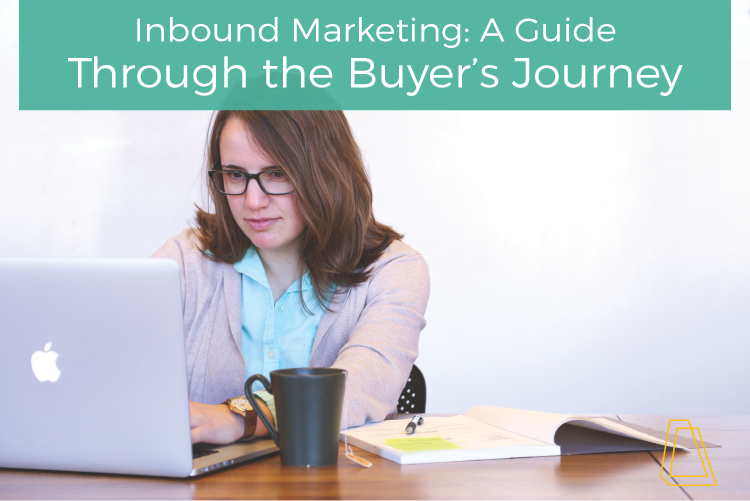 Inbound marketing has one goal in this model—to pull consumers through the funnel at each stage and ultimately purchase your product or service. There are different versions of the funnel, but all are very similar. Some contemporary models of the buyer's journey only contain three stages: Awareness, Consideration and Decision. The model I chose to focus on contains six stages: Awareness, Familiarity, Consideration, Purchase, Loyalty and Advocacy. 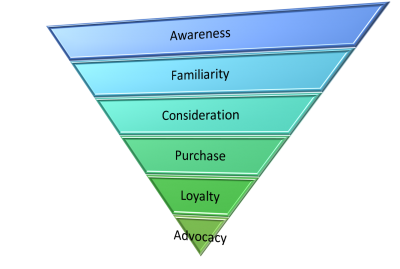 Each stage of the purchase funnel has inbound marketing strategies associated with it to influence buyers to a purchase decision. Let’s take a look at what each stage involves and possible marketing strategies to use. Awareness is the initial stage of the buyer's journey. At this stage, the buyer is likely unaware of your brand or product and possibly unaware they have a need. Your inbound marketing should be focused on introducing your product, service or brand so they at least know you exist. Paid advertising through TV, direct mail and social media are great ways to reach new audiences. However, introductory advertising should mainly focus on their pain points and how you can solve them. This is how you will capture interest and become more memorable. According to HubSpot, 50% of companies say they are consumer-centric versus being focused on sales, marketing or product. In the Familiarity stage, buyers will realize they have a pain point and will seek more information. According to Salesforce, about 72% of buyers will turn to Google to begin their research. SEO marketing and keyword research will help your company show up in the top results of their search, and because they are somewhat familiar with you they will likely seek out more information. The goals of inbound marketing at the Familiarity stage are to drive traffic to your website where you can educate them on how you will solve their problems. White papers, infographics, testimonials and customer reviews should be readily available to help nudge them in your direction. This is also a great opportunity to get them to sign up for your email list for future email marketing. After their initial research, buyers will be able to eliminate companies that don’t serve their needs in the Consideration stage. Buyers will have identified potential choices and will begin to prioritize and compare them. If your website and informative material get buyers to consider you, you’ll want to establish trust and credibility as well as convince them why you are better than the narrowed competition. Infographics, white papers, email marketing and social media promotions must drive a call-to-action to get them to choose you. The Purchase or Decision stage is when the buyer decides what to buy and who to buy from. Your inbound marketing and content at this stage should be related to users that have had a positive experience (which you hope is everyone). Publish case studies and testimonials to influence other buyers to make a purchase decision. The buyer has purchased your product and had a positive experience. Now you want them to keep buying from you. At the Loyalty stage, a buyer is loyal to your brand and prefers your products over others without having to do additional research. Inbound marketing content should focus on loyalty rewards programs, highlighting their positive experiences and utilizing continuous reminder advertising so you are always top of mind. Email marketing targeted to segmented lists of previous buyers is a great way to get repeat business. Once buyers have become loyal to your brand, it’s time to push them to tell others about their positive experiences. At the Advocacy stage, consumers will actively promote your brand and products through word-of-mouth marketing, the most persuasive form of marketing. Given that brand advocates serve as your marketing agents, provide them with the resources they need to be successful. For the most influential advocates, you can promote their social media posts about your brand, send them samples to try out your latest products for their review and reward them for their loyalty as they continue to purchase your products. This buyer journey serves as a framework for your marketing strategy, allowing you to map your content at each stage. It can be a challenge to get buyers from one stage to the next, but an appropriate content plan will make that a lot easier. Inbound marketing at every stage is crucial to create a prosperous buyer-brand relationship. Are you interested in implementing inbound marketing at your business? Let's connect. Request a consultation with Milwaukee inbound marketing agency, Accelity Marketing.